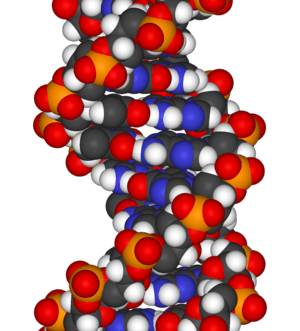 the structure of DNA would not have been revealed in the U.K. Most likely it would have been discovered in Linus Pauling’s laboratories in America. Wilkins and Franklin et al., exploring x-ray diffraction patterns at Kings College in London. in particular to the mechanisms causing division of living cells. In the 1940s it was still being debated as whether it was the nuclear protein, the DNA or both together that were instigating cell division. Randall was convinced by the work of Avery and others that DNA alone was the agent of division. Accordingly he had several avenues of research progressing in his laboratory concerned solely with DNA. was a disappointing, fuzzy fiber diagram. as a gold standard with those from my various attempts to persuade rams’ sperm to lie flat. displace the air with hydrogen. so form micro crystallites throughout each fiber. (The result is shown in the Figure). the concept of the sphere of reflection and reciprocal space. The measurement of layer—the line separation in the pattern shown in the Figure gave the C axis repeat of the unit cell. Monoclinic C2 with values of A=22.0 Å, B=39.8 Å, Beta=96.5°, C=28.1 Å. Thus, in late 1950, we had a unit cell with a diad axis at right angles to the fiber axis and the space group of crystallized gene material. from single fibers of NaDNA. This was something that no other lab was currently able to do. material, such as was our sodium salt of DNA. solving the puzzle of our beautiful diffraction pattern. from the Wilkins/Stokes team to work exclusively with her. vis-à-vis Randall in the structure and politics of the laboratories as a whole. Unfortunately Franklin thought that she was a senior post-doctoral fellow and completely independent. Wilkins assumed that she would freely interact with him. The seeds of conflict were sown. In retrospect I should have realized this and tried to prevent this conflict. Early in 1951, Wilkins met James Watson at a conference where he had presented our work. Watson asked Wilkins if he could join the group at King’s but was rebuffed. Consequently, he went to Bragg’s unit at Cambridge, where he met Francis Crick who knew our work, as he was a close friend of Wilkins. 92% humidity and to do this with a single fiber. This painstaking experimentation I later realized was the hallmark of her science. She was able to show that NaDNA could exist in two stable forms, which we named A and B. We realized the published fiber diagrams up to now had been mixtures of these two forms. That I had produced a pure form of A with Maurice’s multifiber specimens was serendipitous. and getting a spark from 50,000 volts on the rather old x-ray tube. 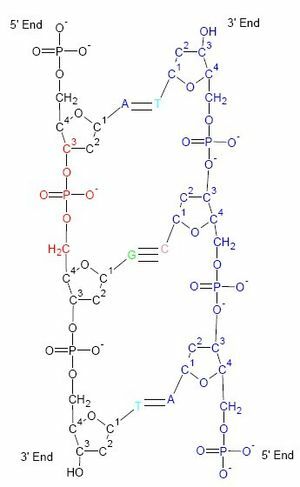 diameter was 20Å and the repeat distance was 34 Å containing 10 nucleotides per turn of the helix with a slope of 40°. Franklin was more interested in the crystallized gene structure shown in “A.” Her view was that although “B” was helical it did not necessarily follow that “A” was. calculate a Patterson Function from the data. This would show helical or asymmetric chains (without the need to build models). and the sugar rings coming out to the bases on the outside. We knew the Na/P complex must be on the outside of the structure because the water went in and out so easily. there are 3 billion base pairs in the human genome. it required greater flexibility to allow folding of the structure to fit into the cell nucleus. For us, model building was out. Bragg forbade Watson and Crick from any further model building. The DNA problem, it was agreed, belonged to Kings! However some months later, on learning that Pauling was actively thinking of DNA structure, Bragg lifted his ban on model building! two chains per lattice point related by a diad axis, i.e., one going up and one going down. When they added to this data, the specific pairing of the bases all fell into place. We were summoned once more to Cambridge. We were now convinced. It was so elegant, it must be right. Frankin and I examined our Patterson data and everywhere we looked we could see indications of a double helix. and use of the data that may be wrong. However, when experimenting with living material, even the protocol of the experiment may be questioned. and the creation of new transgenic life forms. A problem probably more important than global warming. under the leadership of Sir John Randall. Every POST must include a SEARCH on the topic PRIOR to push on the PUBLISH button. Please adhere to this SOP for all future posts of yours, citation of prior work is basic. We need the ping backs, as well. I am aware of what you refer to. I knew about them. It was late, and the crappy software didn’t bring them up. I have enough stress in my life to have to worry about that. I’ll add them in now. I have to work with WordPress, but they aren’t user friendly. I just got a post from Mark Cohen about the absurdity of the physician having to use an EHR, that is costing millions for the health care system, and has provided marginal benefit. Viola Spinelli said it replaces a lot of metal cabinets. But Perry Seamonds knew that the companies have no interest in anything but BILLING CAPTURE. Thanks a million Larry, for providing this insight about the most significant role that Rosalind Franklin played in DNA discovery….which regretfully remains unrecognized. My salute to Rosalind Franklin, one of the greatest Heroes of Science!